Authoritative Review of the Shark IONFlex DuoClean Cordless Ultra-Light Vacuum (IF201)! The new Shark IONFlex DuoClean Cordless Ultra-Light Vacuum (IF201) is designed to offer a convenient cleaning solution with sufficient runtime capability to complete a whole-house cleaning of all floor types with unsurpassed versatility! SharkNinja Operating LLC (formerly EuroPro) began in 1995 and has since expanded to include offices in the United States, Canada, the UK and China. Their products are available from major retailers around the world. SharkNinja has been recognized for 5 of the last 6 years as one of Inc. Magazine’s fastest growing American companies. Their products are characterized by cutting-edge, user-friendly technology. The company creates an environment that fosters “breakthrough thinking” with a passion for creating the “next big thing” with their customer satisfaction at the root of product development! My review of the new Shark IONFlex DuoClean Cordless Ultra-Light Vacuum (IF201) is necessarily longer than most of my reviews because of important issues concerning Cordless Vacuums and the complexity of this interesting vacuum. Cordless vacuums have captured the attention of the consumer. Any product that promises to make our busy lives easier is eagerly embraced, although in some cases undeservingly. When the concept of cordless stick vacuums was first introduced the hope and expectation was that it could possibly replace the traditional corded upright vacuum! This elusive goal is glaringly obvious as I examine the Shark IONFlex DuoClean Cordless Ultra-Light Vacuum (IF201). Like every other Shark vacuum I have reviewed the build quality of the Shark IONFlex IF201 is good. The plastic parts fit almost seamlessly together making a strong, yet lightweight unit. Each of the attachments connects easily into place and stay attached until you remove them. The moving parts function without slop or excessive play. One of the features I really like about the Shark IONFlex Cordless is that the battery station is located in front of the grip opening and away from your hand so you do not notice the heat as the battery is discharging while running the vacuum. This is an important feature to include to be able to use this vacuum for extended cleaning. This is one of the drawbacks to the Dyson V Series! The Non-Removable Battery is located at the lower portion of the grip and it can become uncomfortable hold after about 10 minutes of operation. 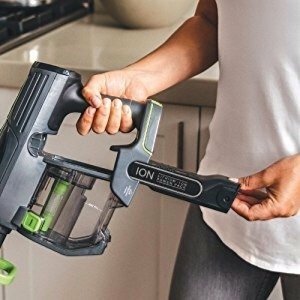 When it comes to Runtime the Shark IONFlex DuoClean Cordless Ultra-Light Vacuum (IF201) gets its power from a 25.2 Volt Removable & Rechargeable Ion Battery. It is one of the most powerful batteries currently offered with a cordless vac. The successful Dyson V8 Absolute is a not-so-close second at 21.6 Volts. Most battery-operated vacuums simply don’t run long enough to really make them worthwhile. Let’s face it; the manufactures could solve that issue by simply installing a car-size battery in a vacuum cleaner! That would provide enough runtime to clean the whole house, the basement, garage, and start the car when you’re done. The average car battery weighs about 27 lbs. That’s about 3x the total weight of the average cordless stick vacuum. So, the problem isn’t just about runtime – it’s about balancing the weight factor with enough running time to be practical. The superior solution (in my humble opinion) is to design the vacuum so that the battery pack is easily removable so it can be swapped for a fully charged battery when its charge is depleted. That’s exactly what the engineers SharkNinja decided to do with the Shark IonFlex. 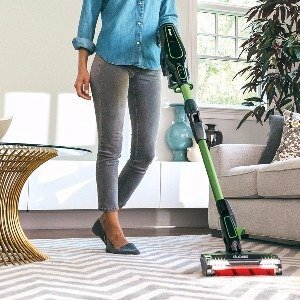 One battery is included with this vacuum plus a charging doc that it can be strategically placed in your home to keep a 2nd (optional) battery charging while using the other. Recharging the batteries take approximately 3.5 hours. To make the (2) battery strategy effective, the idea is to first fully charge both batteries when you first receive your new vacuum. That way you will have one fully charged and ready to swap for the battery when its charge is depleted. Don’t expect to re-charge the just-used battery until it has cooled down. What some customers don’t seem to realize is that when any battery is providing power to a motor it becomes quite warm and usually will not receive a charge until cooled down. This is one point why it is important to read the provided Operator Manual! You can expect about 25 minutes of runtime on the High Setting and about 40 minutes on the Low Setting. That is roughly comparable to the Dyson. If you choose to purchase the “Extra Battery Bundle” option those runtimes will double, easily providing enough operating time to clean several large rooms. When it comes to choosing any vacuum cleaner, the bottom line is Cleaning Performance! Cleaning performance is a combined function of Suction and Agitation. The truth is that it doesn’t require a great deal of suction to lift ordinary dirt, dust, hair, and debris once it is set in motion. That’s why it’s important that your new vacuum is equipped with a motorized rotating brush roll. For cleaning carpet those bristles should be stiff so as to dig down into carpet pile, loosening embedded dirt and hair so it can be lifted into the vacuum nozzle. The rear brushroll of the Shark IONFlex DuoClean Cordless Ultra-Light Vacuum (IF201) does have the stiff bristles for carpet. It does a very thorough job of deep cleaning even long-pile carpet. Removing Pet hair is no issue for this vacuum! Although it takes slightly more effort to operate, I find it cleans carpet equally as well as the Dyson V8. DuoClean Technology! DuoClean, as the name implies, amounts to (2) separate and distinct motorized brushrolls. As I mentioned above, the rear one is designed for cleaning carpet. The front one is composed of Soft Microfiber Bristles that surround larger debris such as dry cereal or pet food so it can be moved to the suction zone and be lifted into the vacuum nozzle instead of flinging it across the floor. Not only does it work extremely well for large debris, it gives a polishing effect to smooth floor surfaces. The Shark IonFlex 2x is one of the best cordless vacuums for hardwood floors I have reviewed so far. I would say it compares equally with the Dyson. What you will encounter is that sooner or later the soft front brush will need cleaning. SharkNinja has designed the vacuum head so it’s easy to remove and clean with soap and water. If I had to come up with a phrase to describe the Shark IONFlex DuoClean Cordless Ultra-Light Vacuum (IF201) it would be “User Friendly!” SharkNinja tends to place that at the forefront of its design criteria with all their vacuums. Light weight at only 8.7 lbs. and well balanced it is easy maneuver around the floor. 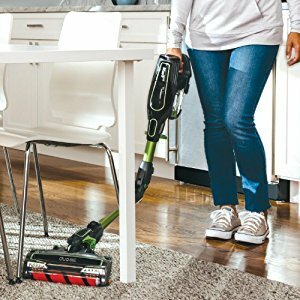 Swivel steering has pretty much become a standard feature with top-rated cordless stick vacuums and it enables easy steering around obstacles and puts less strain on the wrist. It eliminates the need to move furniture in some cases which also helps save time. The Smart Response Technology works great to gives you a range of options for customizing power options to maximize cleaning performance on smooth floor and carpet. The MultiFLEX Technology is another distinguishing dual-function feature of this vacuum. It enables you to articulate the Wand so it very easy to vacuum under low-clearance furniture without bending overt. Perhaps the most significant role MultiFLEX plays is it makes it possible for this vacuum to Stand On Its Own making it the only vacuum currently offering that capability! This is one of the main complaints most customers have with this type of cordless “motor head” vacuum. With other vacs its necessary to lean it up against a piece of furniture or return it to a wall hanging bracket when not in use. 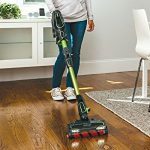 MultiFLEX is the feature that gives the Shark IONFlex DuoClean Cordless Ultra-Light Vacuum (IF201) a significant advantage over the Dyson Cordless Stick. The Shark IONFlex DuoClean Cordless Ultra-Light Vacuum (IF201) has the familiar Handheld 2-in-1 feature that allows you to use it for quick clean-ups around the house. Use the Anti-Allergen Dusting Brush for cleaning shelves and vents. The Wide Upholstery Tool works great on furniture. Or, use the Combo Duster Crevice Tool for cleaning in tight places. 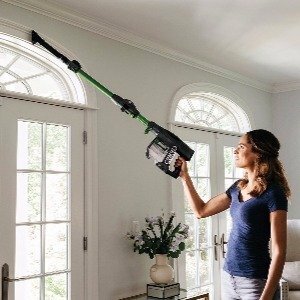 With the MultiFLEX Wand attached take your cleaning above-floor to access difficult to reach areas. Unlike every other cordless stick vacuum currently available, simply fold the Shark IONFlex DuoClean Cordless (IF201) into the Park Position. This feature is such a time saver and one of the reasons I have become quite impressed with this vacuum. 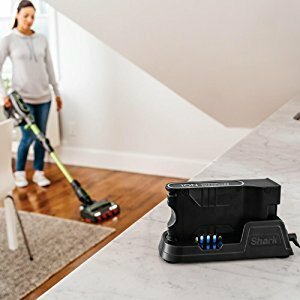 The Shark IONFlex DuoClean Cordless Ultra-Light Vacuum (IF201) utilizes Cyclonic Technology to separate dust and dirt from the air and Cleanable Sponge Filters to trap smaller particulates from passing through the vacuum and being blown back into the air. Actual effectiveness of the filters is currently unavailable but it’s safe to say they are not as effective as HEPA-Level filter material. I am not sure why SharkNinja opted not to include HEPA filtration. Shark vacuums are generally revered for their allergy-friendly filtration. Perhaps it’s an effort to keep the price down or possibly to minimize air flow resistance for more suction! Whatever the reason, I would like to have seen this vacuum with a HEPA upgradable option available for those of us who suffer with respiratory problems. Because of the two separate brushrolls, the Shark ION Flex DuoClean Cordless Ultra-Light Vacuum (IF201) has a tendency to pull itself along like a Self-Propelled vacuum when cleaning carpet. This certainly requires almost no effort for pushing the vacuum forward but it takes some getting used to when pulling it back. This isn’t an issue for me but a small or weak person might find it objectionable. Because of all the new features of this vacuum I ran way past the normal number of keystrokes with most of my reviews. So, I shall try and keep my summary as brief and to the point as possible. The cleaning performance of the Shark IONFlex DuoClean Cordless Ultra-Light Vacuum (IF201) is excellent in all categories – Carpet, Smooth Floors, and Above-Floors. The DuoClean 2 brush roll system is one of the best ideas I have seen for cleaning hardwood and other types of smooth floors. This vacuum surpasses other cordless stick vacuums in functionality. Its light weigh at only 8.7 lbs., swivel steering, and the ION Flex feature make this vacuum very User Friendly! Free-Stand Parking gives this vacuum a decided advantage over every other cordless stick vacuums currently available. Another feature that deserves recognition on this vacuum is the Smart Response Technology that makes it possible for you to Customize power settings to give you the best performance on your carpet or smooth floors. The tipping point for me is the SharkNinja 5 Year Warranty with 2 years on the battery compared to the Dyson V8 Ablsolute’s 2 year warranty which is a higher priced vacuum. That tells me a lot about the company’s confidence in this vacuum cleaner’s quality and life expectations. 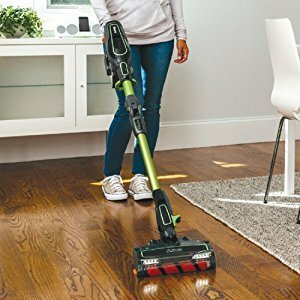 All in all it’s my opinion that the Shark IONFlex DuoClean Cordless Ultra-Light Vacuum (IF201) compares very well with its main competitor, the Dyson V8 Absolute. In all areas of cleaning the two vacuums are about equal. The Shark IF201 is significantly more versatile with its IonFLEX and Smart Response Technologies. Runtime with one battery, both vacuums are neck and neck. But the IONFlex IF201 runtime can be easily doubled and the Dyson V8 cannot. quart capacity Dust Cup means less trips to the trash can than with the Dyson V8 with only .148 gal. The ability to Free-Stand gives the Shark a big advantage over the V8 and the 5 Year Warranty make it a no-brainer for me! 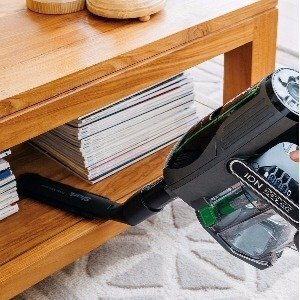 With the ability to easily swap battery for a 2nd (Optional) battery for extended runtime of up to 50 minutes on low power and up to 80 minutes on high make the Shark IONFlex DuoClean Cordless Ultra-Light Vacuum (IF201) about the only cordless vacuum I can seriously consider as a Primary Vacuum at this time. However, if that’s the role your looking to fill with this vacuum, keep in mind the Dust Cup holds 0.3 Quarts. Although that’s more capacity than the Dyson, its relatively small compared to a full-size corded vacuum. That could be an issue if you have pets that shed a lot of hair. I believe this unique vacuum represents good value and will prove to be a welcome asset in any household! 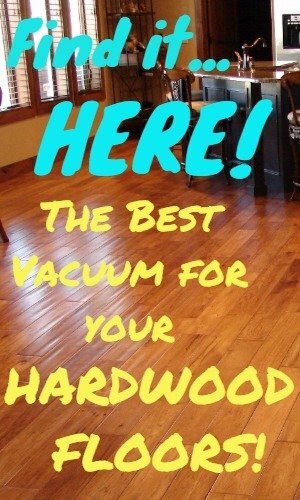 With the 5 Year Warranty this vacuum makes a very smart option! I highly recommend this vacuum! Weight 8.7 lbs. 5.8 lb 7.3 lb. 7.3 lb.